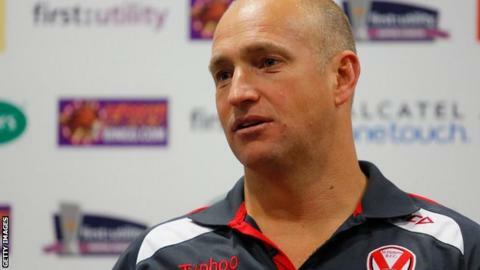 St Helens coach Nathan Brown has spoken of his pride after his side secured the Super League's League Leaders' Shield. Saints finished top of the table after Castleford Tigers failed to beat Catalan Dragons on Saturday. The 41-year-old told BBC Radio Merseyside: "I think it's a good reward for the players and for the whole club. "We're really proud of the guys for what they have achieved and hopefully over the next four or five years, this squad can win more trophies." St Helens finished first despite Friday's 17-16 defeat by Huddersfield Giants. "They've got over a fair load of adversity along the way so it definitely wasn't handed to us," Brown added. "We were confident we could win enough games to do well. "I think it's been a pretty tight year and there have been a lot of twists and turns but we have led from start to finish." What set St Helens apart from the rest of the Super League? Only 11 points separated the top eight teams in the Super League table. "If you look at teams seven and eight, they've had some great results this year," Brown continued. "Catalans are probably the best seventh-finishing roster I've seen since I've been here, so the bottom part of the competition has got stronger and the top teams are there on merit." This season is the fifth time that St Helens have won the League Leaders' Shield, after consecutive successes between 2005 and 2008.